Sunday, October 12, 1913: Went to Sunday School this morning. Ruth and I went up to church this evening. It was so nice and moonlight. Some of the girls walked down the road with us coming home. This diary entry makes me feel both good and worried. Let me explain. 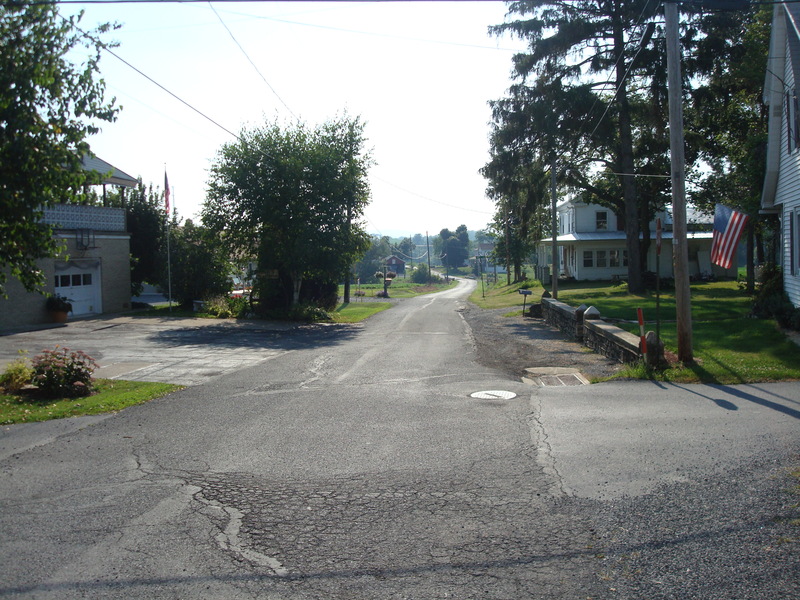 I can picture Grandma, her sister Ruth, and their friends ambling down the road from McEwensville toward the Muffly farm on a beautiful ,unseasonably warm, October evening. I don’t have an evening picture of the road, but here’s a daylight picture of it. I imagine a group of five or six girls in long skirts chatting and giggling about guys, friends, clothes, work, and all of the other important things that teens talk about. And, in my mind, I envision that as they neared the midpoint between town and the Muffly farm that the group separated with Grandma and Ruth continuing on—and the other girls returning to McEwensville. This entry reminds me that Grandma often had to walk home alone in the dark after church, community, and (before she graduated) school events. Some of those nights were in the dead of winter—and it must have been excruciatingly cold. Maybe people were just used to walking at night in rural areas back then, but I worry about her safety. (I know it’s a hundred years too late to worry—but I do it anyhow). Did Grandma ever feel scared during the mile or so walk home through the dark countryside? Posted on October 12, 2013 October 11, 2013 by SherylPosted in OtherTagged family history, genealogy. Previous Previous post: Were Children Paid for Working on Their Family Farms a Hundred Years Ago? Next Next post: Was a College Degree Worth More a Hundred Years Ago than it is Now? At least they didn’t have to worry about cars speeding by. Definitely a lot safer then, but maybe a little spooky. Yes, and did they have any sort of lighting, as in lanterns? I’m guessing that they didn’t–but I’m really not sure. By scared do you fear of being harmed by someone? I guess there was always crime but I bet it was less likely 100 years ago as compared to today. I remember just in my lifetime how much it has changed. When my siblings and I were young in the late 60’s early 70’s we used to go about everywhere on our own. I could never let my daughter do the same in the 90’s and today. Yes, I guess that I was thinking about crime–though I realize that obviously was rare. I do not think that there were the same worries then as there are now, as predatory abductors. It was a lot safer then in that regard. I think that people generally knew everyone who lived nearby back then, so they felt safer. But at the same time, it was easier for someone to move from one area to another without anyone knowing anything about their past–which created a set of risks. I agree with the other commenters. I grew up in a rural area (on a fairly well traveled highway, though) and we never worried about things that are happening today. We never even locked our doors! It saddens me to see the way our country has changed. Yes, times sure have changed–and sometimes not for the better. Maybe it’s because I’m in Britain and not the US, but I don’t have the same worries about rural walks like this. What an absolutely beautiful lane to walk down in the moonlight! back then it was darker then what we experience today with street lights etc. I bet it was somewhat unnerving along with the silence. wild animals may have been more of a scare then man. And, I bet that sometimes there were loose farm dogs that might have been frightening. I enjoy walking in the winter and I am sure they wore wool clothes and were not cold. I also enjoy walking in the winter; and am really proud of myself when I take a walk (even if it’s just a short one) on a really cold day. I’ll bet she wasn’t scared. Well, maybe of the animals — but she was a farm girl. PRECIOUS. Even the mundane becomes fascinating through the lens of history. She sounds like she loved the experience–having people to walk with would change everything. You’re right. walking alone is a very different experience from walking with friends. Makes sense. I’m sure that you’re right. I am not 100 but I am in my 70’s and I have walked in rural areas and on city streets at night having no fear but I could not do that today. It has changed so much and safety is a much bigger issue now than it was back then. I agree the cold walks would have been a dampener on the day. These days, we pick our kids up in a warm, heated car. Too easy! We’d probably be healthier today if we walked more. I imagine it was really dark along that road, though the moon probably provided some light. Back then people didn’t even lock their doors. They didn’t have media 24/7 of everything going on around the world. It would be interesting to know what her thoughts were on that. People used to take great pride in living in a place that was so safe that they didn’t need to lock their doors. Too bad there’s not much of that any more. What a fun story–and (except for the age difference) amazingly similar to the diary entry. The only thing I worried about at night (no lights where we lived either) were the dang bats flipping by. I fell down once and skinned my knees pretty good on the gravel road when one zipped by too close. I don’t imagine there was too much riff-raff driving by out there, but you never can be too cautious. I also don’t care too much for coyote’s howling in the dark, I’d hang on pretty tight to Buddy. Sometimes I’d sing…really loud so they’d know I wasn’t a snack.